Hello kids! We have a brand new game for you! 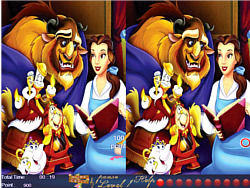 In this game, we'll give you two Belle and Beast pictures and ask you to find the differences between them. There are 10 differences and 4 levels, you have 1 minute for each level. But be careful, even though the differences give you 100 points, every wrong click will take 10 points from you. Have fun!